Wage war in MP and beef up your soldier with a new perks system. Today, Activision announced that Call of Duty: Black Ops will be deployed on Nintendo's DS on November 9th. Like previous Call of Duty titles for the platform, it's a first person shooter that attempts to capture the spirit of its console counterpart. In the game, you'll step into the shoes of CIA-backed operatives in a robust single player campaign. On the multiplayer front, you can enjoy six-person match-ups, a perks system, two-player co-op, Arcade and Challenge modes. "Call of Duty: Black Ops for the Nintendo DS is going to take the handheld Call of Duty experience to a new level," said Dan O'Leary, n-Space Studio Head. "From taking the controls of an attack helicopter to flying an experimental stealth fighter jet, players will have a wealth of new features to utilize." 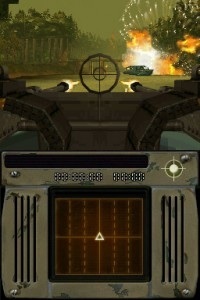 To make things even more official, the publisher released a set of screens, some of which display air combat. We'll see how things shape up when the game debuts this fall. That is, if we can tear ourselves away from the Xbox 360 versions.